Here at UGL, we regularly receive success stories from satisfied customers. 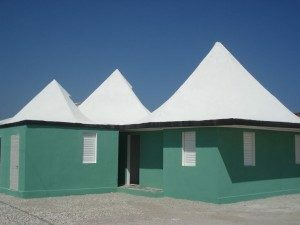 “When TSC Global built our show home in Haiti, we needed a waterproofing material to cover our thin shell cement roofs (pictured here). We found DRYLOK® at a local materials dealer and decided to give it a try. What caught our attention was the little demonstration (DRYLOK® Action Display) the store had set up with DRYLOK® coating a cinder block and water running through the block. Water was pouring through the untreated side of the block while the DRYLOK® side was completely impervious to water. We placed the DRYLOK® on three thin shell roofs following the label instructions. Two coats were applied. We finished up the project then returned home to the US. Shortly after we left, three major tropical storms rolled through Haiti subjecting our roofs to a severe test as to its ability to withstand wind and water. When we returned to Haiti a few months later, and met with our project people, they reported that there was absolutely no leaking from any of our roofs. The roofs appeared to be completely undamaged and as beautiful a white color as when we left.